Thanks for having the courage to post this Mac, it strikes me as utter insanity that a priest would want to dismantle the hard work of his predecessor so thoroughly. What ever else, this has all been dealt with appallingly. I will remember you all in prayer. Please God someone in the hierarchy has the courage and insight to do something about it. Nothing short of a re-run of the 1970s. The Magic Circle retreated to their corners during the tenure of Pope Benedict. Now the gloves are off and, unhappily, I expect to see more of this infantile form of revenge, dressed up as the new buzzword "pastoral". In my own diocese of A&B I do not doubt there will be many dropped shoulders when the new incumbent is announced. We certainly need prayers, but we need to say them more fervently, too. God Bless the parishioners at Blackfen. Unfortunately for Fr Fisher a number of the parishioners that attended the Sunday EF 10.30am Mass also were involved in other various activities for the Parish and he has lost that assistance. (at least until he finds others to take these activities on) Those of us who no longer attend the 10.30am Sunday have moved else where and myself and my family are happy that we have moved. I was shown by a friend who attends the 9am Sunday mass a copy of the newsletter from last week where Fr Fisher states that it wasn't his intention to cancel EF mass and his is surprised by the reaction and the significant drop in numbers. He has put it to the parish council to vote on what to do next. However the Parish council is comprised of people who do not support the EF mass and he did make it clear that by the end of September the EF would no longer take place. My personal view is that by asking the parish council to vote on this question.He can state that there is no longer any demand for the EF Mass at Blackfen. All part of a plan only you can decide. Thank you very much for this post. It is refreshing to be able to read about the whole affair without needing to wonder if something has been exaggerated or twisted. It is all very sad but God can make good come out of anything and I'm sure this occasion will be no different. I am very glad that I visited the parish for the first time just before Fr Finigan left. Now I can say I was there and witnessed a beautiful TLM in all its glory at Our Lady of the Rosary in Blackfen. **sigh** All so sad, and all so unnecessary. Courage. You've covered everything that needed to be said. Mac, you mentioned our friend, Richard Collins. Prayers are needed for Richard. God Bless Richard and his wife, Sally, and family. Thank you very much for giving concerned Catholics the facts of this sad case. It is only reasonable to presume on the available evidence that the whole thing was a set-up from the outset. This is the kind of devious viciousness that the Sacred Mass of All Ages can evoke - it disturbs the demons greatly. I hope and pray there will be healing and restoration in the parish at some point not too distant; and that everyone regains access to our liturgical heredity very soon. In Ireland, the situation is appalling, with, not only the majority not having access to the Traditional Holy Sacrifice of the Mass but the vast majority not even having been informed by their bishops and priests (deliberately) of their right to its availability, or even that it exists!! How can people request it as "a stable group" if they are not aware that they may do so, (or, more appropriately, that they are invited to do so!) or that the Ancient Mass is still the Mass of the Church; and, of course, how do they know that they desire/need the traditional liturgy (including Liturgy of the Hours) if they have not been taught the full, true Faith (as most have not)? It is clear that people have been left uninformed on the matter as a deliberate ploy by those bishops and priests opposed to the reintroduction of the Traditional Mass. Thus, has the whole purpose and intention of SP been subverted, in most places in the world. Thanks for this post. It must have been very painful for you to write it. Nevertheless it was needed. I am glad you waited for some time before writing it. Please be assured of prayer. The impressive thing about Southwark is that it hasn't been known for intolerance and abuse of position. I pray this is not a straw in the wind. As a long standing parishioner and a supporter of Latin Mass there is something I must say here to put the record straight. I have attended every Sunday 10.30 Mass at Blackfen, bar one when I could not attend mass at all on Sunday for health reasons, since Fr Steven took over from Fr Tim and every single mass has been a Latin Mass and beautifully celebrated I can tell you - albeit with one alter server as all the others appear to have jumped ship - why?? 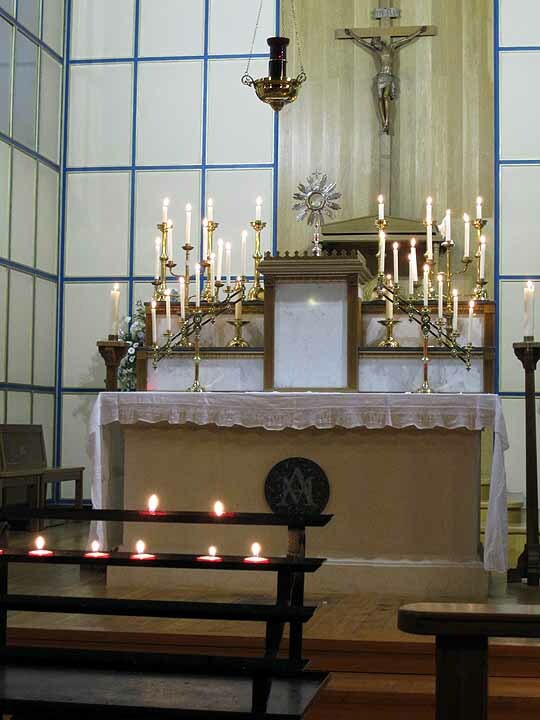 Fr Steven has said he will continue the Latin Mass on Sundays at 10.30 which he loves to celebrate, until the end of October, because will something like only 30 parishioners in attendance (my count last Sunday) it is not viable to continue. I can understand that and our family will continue to support Fr Steven in any which way we can to help rebuild 'broken bridges' and mend 'broken fences' in the hope that one day we will have a monthly at least if not weekly return to our beloved Latin Mass. Excellent post, but the story still doesn't make much sense to me. There are people who are EF-phobic (which is arguably a heretical position to be in) but Fr Fisher did not suffer from this malady in the past. I think he owes the world a public statement: was he under orders from on high? I am as impressed by your restraint as I am angered by what you describe. It would be interesting to hear what your LMS representative has advised you all to do. What have they said? George - the week you were away is the week he told the congregation at the 10:30am Mass that we were divisive and toxic and the cause of division and as it was his responsibility to heal division he would be stopping the celebration of the TLM from the end of September. He actually stated that the Mass would stop for that reason. To now say that he is *now* going to have to stop because of falling numbers is disingenuous (at best)-numbers fell because, after his words and actions, people thought they had better make alternative arrangements to be able to attend a TLM. The best advice that I can give is to implement the provisions of Summorum Pontificum. If the procedures set down there are followed to the letter, the process is threefold. ie Pastor, Bishop, Ecclesia Dei Commission. The first step is to gather a stable group and submit a formal letter of request. Fr Fisher cannot ignore this. If a satisfactory solution does not emerge, the next step is to take the matter to Archbishop Smith, who also cannot ignore the matter. It may be that at this stage, the possibility of regular Latin Masses at a nearby church could be considered. I don't know the local geography, so am unable to suggest another church, but I would expect that there is one that is more suited to the Extraordinary Form. It strikes me that a fresh start in another church may provide the best solution. what Mac has said is correct he said that the TLM on a sunday would stop at the end of september. Further as a family we attended his first parish surgery, where he said to us that if the children wanted to continue to serve at the 10.30 TLM mass, that they could but it would change to Novus Ordo. he made it crystal clear that there would not be any TLM mass after September. On the way home both our children bust into tears because the TLM is the only mass they have known since being small and they didn't want to serve a Novus Ordo mass out of choice. I did approach our LMS rep however I am not prepared to say on a blog what the results of the conversions where nor what he advised to do. All i can say on that matter is that we now attend another parish and the children are continuing to serve a EF mass. My heart aches for all of you that you're placed in such a position. I won't even begin to speculate as to what's going on; just know that you have my sympathies, and that I'll offer up our lack of a local diocesan TLM this week for you. I grew up in it, and I miss it terribly. I can only imagine having it and then having it taken away like that. Hmm. It appears to me from comments that the good Fr Fisher is attempting to backtrack a little and perhaps save face. Presumably because he has been hit in the only way the laity can hit someone behaving like he has been alleged to behave - in the collection plate and with a sudden lack of parish helpers. The problem with depending on liberals to run your parish is that there are not that many of them and in my experience they generally prefer to pontificate and assist with the liturgy in 1970s ways, rather than help around the parish and contribute generously to the collection, I suspect he may have just discovered that the hard way. If the EF Mass has after all continued into October, then this is good news. The impression I get is that he has been put up to this by certain outsiders (+) who have probably now retreated well below the parapet and left him to his fate especially as they are all in the Doghouse with Rome right now over A&B, the last thing they need is an international uproar over this. Just as making up with a seemingly unrepentant spouse when you know you are in the right is sometimes necessary for the good of a marriage, it may be wise to accept the continuation of the EF into October at face value for the good of everyones soul. Mac, thank you for posting. I think you have drawn the only conclusions possible. How are you getting along with your own spiritual life? Even after 6 weeks I am still so shocked by events at OLOR that I cannot truly comment without bursting into tears, but will just say that like many other parishioners I have had to leave the parish that I loved and had a lot of responsibility for. My son has been an alter server for 11 years and is totally shocked that this has happened and so suddenly. Very sad times and prayers needed for everyone caught up in this tragic situation. Thanks Mac. I have heard it said on Facebook that Fr. Fisher actually YELLED at parishioner re: this entire fiasco. Is that correct (if you know?) My heart aches for Blackfen too. One annoying part is the insult to the intelligence. Is he REALLY relying on people to be ignorant of rubrics. That business regards "can't say mass because of no server" is a bald faced lie and he HAS to know that. "back in the day" even a woman was allowed to give the responses. In the US when I regularly attended the daily EF at St. Anne's parish, sometimes there wasn't a server for the morning mass, and ALL of us would say the responses. And of course, the priest can do the responses himself...as does the priest who has TLM at 5:30 weekdays on a "catch as catch can" basis at Brompton Oratory. [Not an Oratorian, but an Italian priest who lives in the area, and says it a few times a week.] It's not formally listed in the parish, but it's said at St. Wilfred's chapel. But many times he does the responses himself. Does Fr. Fisher really expect people to buy that stuff? He HAS to know better, he's not a stupid man. Personally, one has to ask if +Lynch has "something on him." "Kill off the Latin Mass or else." What really *should* happen is people need to get a petition together and sign it...send copies all over to social network etc. so "the powers that be" can't bury it. The 9 malcontents who were recently installed, can't be the only ones heard. Send to Damian Thompson too so he can give it some play. The "powers" will hate it if he publishes an update that makes +Lynch et al the baddies---WHICH they are. The little girl, who always sang the Ave Maria in Latin...it pains me to think how distressed she must be over this whole thing. Have they left to attend elsewhere? My heart aches for those young boys who faithfully served..especially the lad who finally got to be MC. All that, just snatched away. And I'm angry that Fr. Tim was lied to. Thanks for the insight, Mac. I've noted that something was happening from across "the pond" and your clarification really helps. God willing, it will be put straight and an authentic TLM will again be part of your Sunday schedule. As for "Communion while standing" at a TLM, the Lord forbid! Universae Ecclesiae speaks of later innovations incompatible with the “rubrics” in force at the time. But the distribution of Communion was not described in the 1962 Missal, therefore its rubrics are silent on this. The rules about Communion then in force were as laid out in the 1917 Code of Canon Law; and its canons did not prescribe Communion on the tongue. I believe this to be a moot point but it may be that Fr Fisher’s view may have its merits. But the new (and incomplete!) parish website tells us "All are welcome"
Surely Holy Communion was not received other than on the tongue in 1962? I was wondering when you were going to blog about this. For Fr Fisher to interrupt a TLM before Communion to announce that Communion can be received in the hand is very rude indeed to the sensibilities of the TLMers there and was bound to elicit a response. So sad that a priest should behave this way in the presence of the Blessed Sacrament. I see that George Gawor says that 30 attended a TLM there, I think that's quite a lot. With regards to Fr Finigan, he has moved to a beautiful church (perhaps he'll put some more pics up, and maybe you'll take them MF?). Margate seems like a lovely place. I'm sure Father will up the Mass attendance there, and though a lower income parish, I'm sure those pennies saved will spill-over like the 'loaves and fishes' and Father will know what to do with he 'widow's mite'. Is Blackfen near Margate? Perhaps you can travel over to Margate, MF? I'm sure it's all been a sad upheaval for the parishioners at Blackfen. I wonder if Fr Finigan's move has anything to do with a change in pontificate? It all seems very clericalist and Renaissance Princeling to me. Damask Rose - 30 at Sunday EF Mass is actually very small compared with the 120+ we normally had. I live more than an hour from Blackfen, and never got up there during Fr Finnigan’s tenure. I’m much closer to Margate, and hope to get down there. But we already have an EF Mass over in Ramsgate, quite close to Margate, every Sunday at noon, and often there’s one on Wednesday and Fridays—but as the on-line bulletin sometimes isn’t accurate, I’d advise you phone before you make the trip. Question: is this Fr Stephen Fisher the same Fr Stephen Fisher who used to be parish priest in Ramsgate? I’m guessing the answer’s ‘no’—he was the one who re-started the EF, which has been admirably kept up and indeed developed by Fr Holden.